Daily viewers (return visitors) often go directly to the FRONT PAGE to browse the latest news from The Cardinal. These loyal viewers return daily and sometimes two or three times per day. Referred viewers are referred from search engines, such as Google, Bing and Yahoo! and often land on an inside ARTICLE PAGE, but sometimes land on the FRONT PAGE. Referred viewers also often land on an inside article via Facebook referrals from their friends or Facebook referrals from official Cardinal news feeds on Facebook. Referred viewers also often arrive from Twitter via a shared tweet or re-tweet or from Twitter feeds from our official Twitter accounts. Last but not least, many referred viewers arrive on an inside ARTICLE PAGE from a traditional e-mail. The Cardinal’s Page Views ranged from 170,000 per month to 335,000 per month (6,000 to 10,000 per day) during the period from July 2013 to June 2014. Any ad can be linked to the front page of a website, a company’s Facebook page, or to a special offer or coupon page. Ad fees (advance payment required) are calculated by the number of “shares” you order for an ad space. If you order one share, your minimum cost is the cost for a single share. For example, if you order a single SIDEBAR BOX share, you pay $30 per month (no minimum monthly requirement, but minimum is one month). If you want more exposure, you simply order more shares (if and when they are available). For example if you want maximum exposure, you would reserve an order for all shares (50 x $30 per share = $1500). If another advertiser or advertisers already occupies or occupy share(s), then you can request the maximum amount available (For example, if 35 shares are available, you can order 35 shares at $30 per share, which equals $1050 for the month). The minimum order is one month. If you are ordering for a short-day month with 28, 29, or 30 days, The Cardinal will allow 31 days, if space is available. If you have an upcoming event that is less than one month away, call 847-398-0123 for a special quote. You will still be required to pay the monthly minimum, but if there is space available and depending on conditions, you might be able to acquire more shares for your shortened period, For example, two shares for the price of one. The “HEADLINE BAR” (Option 1) is a 728×90 pixel ad that is positioned at the very top of the page. The ad has high visibility at the top of the page. Use bold colors, bold photos, and bold text, or select a higher number of shares with a more subtle exposure. The choice is yours. HEADLINE BAR Ads start are currently $60 per month for a single share balanced with Google ads. 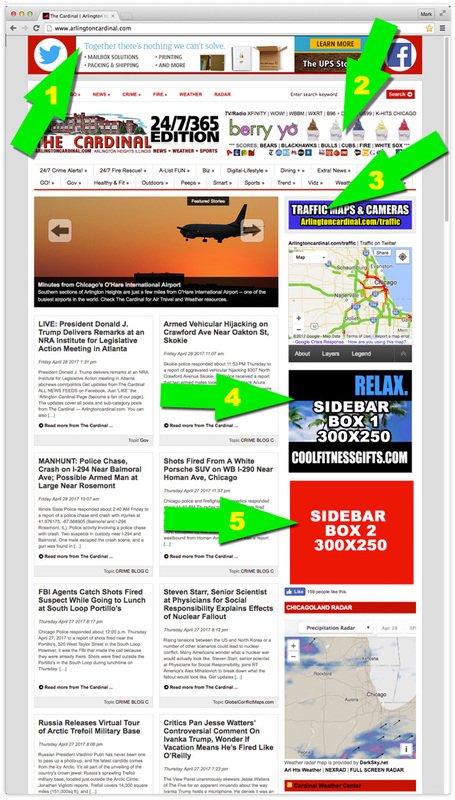 The ad is shared with with Google ads, and will display at least 50% of all page views (front page and article pages). Check below to see the number of impressions per day for the varying amount of pageviews (busier news days cause more pageviews). The “MASTHEAD BAR” (Option 2) is a 468×60 pixel ad that is positioned just to the right of The Cardinal logo. The ad has high visibility at the top of the page. Use bold colors, bold photos, and bold text, or select a higher number of shares with a more subtle exposure. The choice is yours. HEADLINE BAR Ads start as low as $25 per month for a single share. One share randomly appears on a page load with a 1/10 chance of displaying. Check below to see the number of impressions per day for the varying amount of pageviews (busier news days cause more pageviews). One share alway appears on a page load with a 100% chance of displaying. Check below to see the number of impressions for varying amount of pageviews (busier news days cause more pageviews). One share randomly appears on a page load with a 1/10 chance of displaying. Check below to see the number of impressions for varying amount of pageviews (busier news days cause more pageviews). The ARTICLE POST AD (Soon to be known as OPTION 7) is a 300×600 ad space. The space can hold one large 300×600 ad or two 300×250 ad spaces. A business could take the full 300×600 space ($50/month, if available), two 300×250 ads in the space ($60 per month, if available), or one 300×250 ad in the space ($30 per month, if available). The ARTICLE POST AD shows in the content of the article or immediately at the end of the article. The ad has good visibility and often ranks the highest in click conversions. If the total number of shares available are changed, your ratio value for your ad space share remains the same (your shares split). You can also send a personal message, such as Happy Birthday, Happy Anniversary or Congratulations. The sticker grid is five columns across and up to 30 rows. Yes, you can have more than one coupon on the deals page. Group them together horizontally or vertically (if space is available) or scatter them about the page. You can order a sticker for each month, and you can reserve a sticker position for the whole year or more. The minimum pricing is the monthly fee (no pro-rating). For example, if you only want a sticker to display for two days, the fee is still $10. Or if you decide you want to order a sticker on the 15th and start displaying on the 15th, your ad will display until the end of the month — not for 30 days. Each sticker has a grid position and an expiration date. You can order any sticker grid position after its expiration date. The expiration date can be discovered by hovering your cursor from your desktop computer or laptop computer over the sticker. A pop-up displays the sticker grid position and the expiration date. For example, if you want the second sticker in the first row, the grid address is “1, 2” and if the current sticker shows an upcoming expiration date, you can order that position. Keep in mind that the expiration dates are not updated in real time, so it is possible that another advertiser could order ahead of your request. Orders can be taken by form [AD ORDER FORM]. The Arlingtoncardinal.com/deals page with “stickers” will be available in October 2014.